Author(s): Jan Fischer, Dirk Bartz, Wolfgang Straßer. Proceedings: ACM Symposium on Virtual Reality Software and Technology (VRST), pp. 155--158, Monterey, November, 2005. The goal of augmented reality is to provide the user with a view of the surroundings enriched by virtual objects. Practically all augmented reality systems rely on standard real-time rendering methods for displaying graphical objects. Although such conventional computer graphics algorithms are fast, they often fail to produce sufficiently realistic renderings. Therefore, virtual models can easily be distinguished from the real environment. We have recently proposed a novel approach for generating augmented reality images. Our method is based on the idea of applying stylization techniques for adapting the visual realism of both the camera image and the virtual graphical objects. Since both the camera image and the virtual objects are stylized in a corresponding way, they appear very similar. Here, we present a new method for the stylization of augmented reality images. This approach generates a painterly brush stroke rendering. 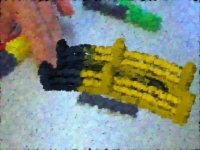 The resulting stylized augmented reality video frames look similar to paintings created in the pointillism style. We describe the implementation of the camera image filter and the non-photorealistic renderer for virtual objects. These components have been newly designed or adapted for this purpose. They are fast enough for generating augmented reality images in near real-time (more than 14 frames per second).